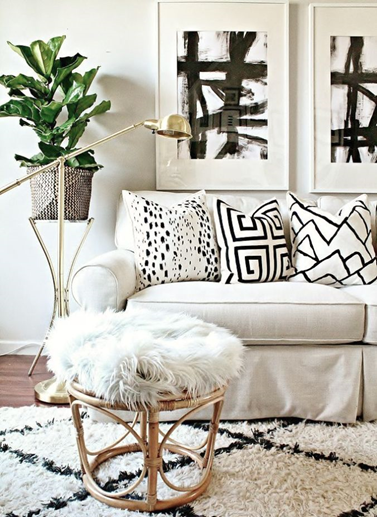 Styles change year to year, and in 2019 Decor Aid’s interior designers are noticing a distinct influence based on bold graphic patterns. From wallpaper, to small decorative items, to area rugs, graphic patterns have sneakily inserted themselves into our everyday decor as well as our investment pieces. In fact, entire rooms have been designed around their intriguing appearance. Homeowners, renters, and interior designers everywhere are going bolder than ever, so it only makes sense that a trend of this nature would appeal to them. What better way to make this tangible than with the inclusion of thick, bold lines? Graphic appearances are defined by the flat appearance of their patterns, which usually use minimal colors and minimal designs. 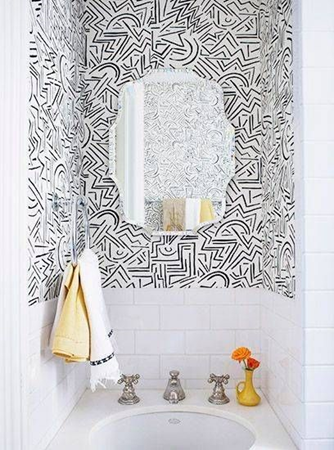 Typically, graphic patterns are a traditional black and white, but the patterns themselves can be anything from a repeating geometric pattern to a freehanded unique scribble. The things to note are the minimal shades and the flat appearance, with distinct separations between colors. You’ll notice they sometimes stray from the expected black and white to include other pops of color too, so don’t feel limited. While graphic prints were typically limited to the small scale, this year we’ve seen them enter a larger realm in home decor. Specifically, wallpaper. 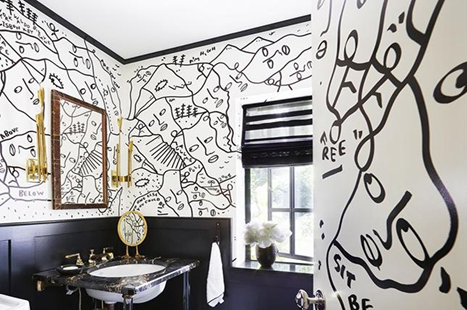 Bold, graphic patterns are making a splash in the wallpaper scene, and are becoming popular among artists who have created their own designs. Because they are so simple in nature, they have broken down the barriers and allowed graphic artists, painters, and other creatives to throw their hat into the ring. You can easily find custom wallpapers designed by artists across the globe that bring an artistic authenticity to your home. Because graphic prints are usually more pared back, it also lends itself to being easily incorporated into spaces that don’t have a lot of color, texture, or patterns. An accent wall or appropriate wallpaper has the ability to change the feeling of the entire space, dependent on the style of graphics you use. You can use these ideas in other realms. Look to pillows and area rugs to bump up a plain room. A cheeky printed pillow can bring personality to a solid couch, and an offset black and white striped rug (an especially popular piece right now), can incorporate a simple timeless pattern into a space. If the idea of using wallpaper is a bit too nerve-racking for you, try incorporating graphics into your interior design in smaller ways that still make an impact. Minimal artwork is in, and there are hundreds of artists that specialize in a graphic minimalist style, relying on freehand linework and bold lines to intrigue the eye.